Last night while grilling, a hummingbird moth swooped down on the BBQ, fell right into the flame, and burned to nothing. The whole thing took less than a second. 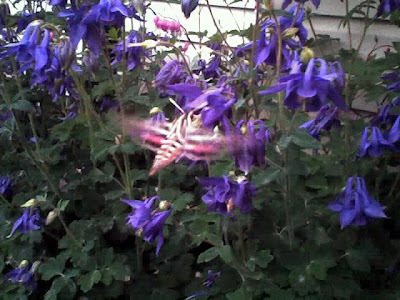 I'm a fan of the hummingbird moth so I hated to see it happen. They like to hang out around my columbine and I like to watch them. Below I have moved a post from my old Yahoo! 360 blog from a few years back. Enjoy. *Update: The old link to the picture from Yahoo! 360 wasn't working for all so I reposted it. Should work now. Also just realized that this original blog post was from three years ago today. Here is a link to the orginal blog entry. The other day I was doing some yard work in the evening and just when I was about to go in the house for the night I spotted what I thought were twohummingbird moths cavorting in my columbine. It turns out they were more likely White-Lined Sphinx Moths or Hyles Lineata. I took about 15 pictures of them. This is one of the best.